Hacienda Baru is a landmark for many of the tourists coming to Costa Rica. The Hacienda Baru Ecolodge and Tour Company is now for sale. Over the years it has established itself as a standard for canopy tours, reforestation and wildlife conservation.
. All of which is situated on 7+ acres of nearly all usable land. 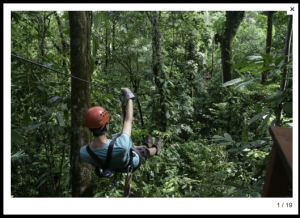 Located just north of Dominical, the tours that are offered include the famous Flight of the Toucan canopy zipline, Night in the Jungle, Birdwatching tours, Mangrove, Rainforest Experience and more. Hacienda Baru is a known destination for student groups, scientists, authors and professors. Posts to their Facebook page frequently go viral due to the sharing and go past 30,000 Likes. They are looking for qualified interest to whom they can pass the torch. There is much that can be done with the existing establishment and as mentioned, there is room to grow.